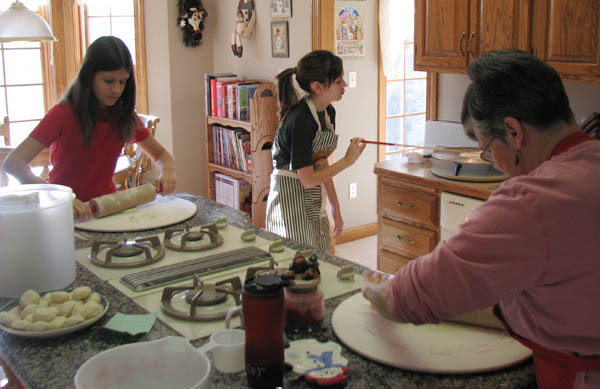 It’s a Holiday tradition in my family to make Lefse. A Norwegian treat, made from potatoes, cream, flour, and “Oleo.” What is Oleo? Why, it’s butter. Lefse looks a tortilla, but has a more delicate texture and a potato flavor. Served, rolled up with butter and brown sugar or just about anything. Pictured here is my Daughter, Niece, and Mother. I’m behind the lens, as usual. My 50th post on this blog! 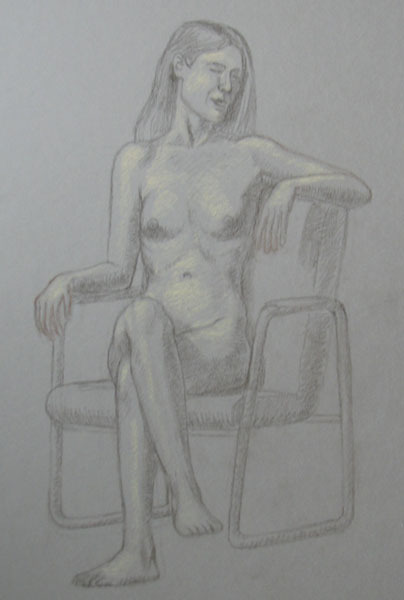 As for the life drawing, I liked this pose very much. We might use it again and draw other angles. I lost a half hour, but managed to get the darks and lights. I will refine it with color. Pastel on Brown Paper. It felt like a doodly day for play. 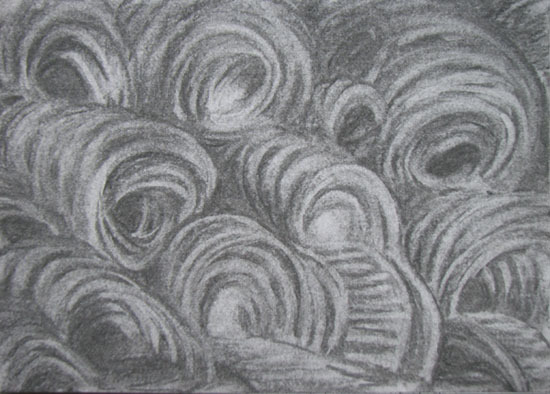 I took out my sketch book, some vine charcoal, and a kneadable eraser. Tucked my inner critic away, and let intuition rule day. 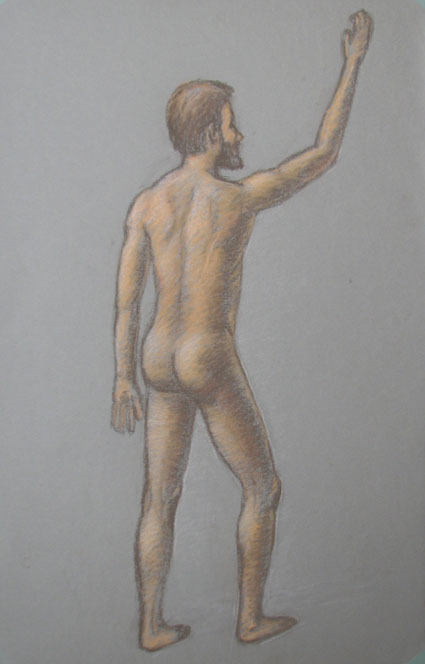 We had our model pose to draw his back. I would have liked his arm down, but others were trying to give him an action pose. I don’t think it worked so well. Maybe I’ll have to try putting something in his hand. It was held up by a pole for his comfort. I will let it simmer until I come up with an idea. I was pleased that I got it all drawn and shaded within the 1.5 hours that we usually have to work. 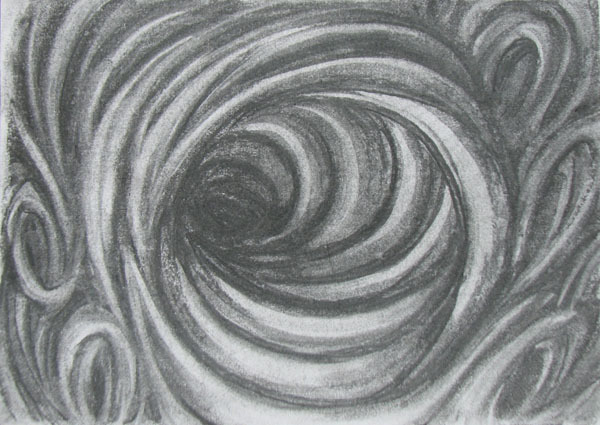 Hard Pastel on Brown Canson Paper 19.5″ x 12.5″.